Get free chapters and tables of contents of our popular books like Basic QC Practices, Assuring the Right Quality Right, Six Sigma QC Design and Control, Basic Method Validation, CLIA Final Rules, Basic Planning for Quality, and more. You must be a member to download these chapters - but membership is free. A preview of the Table of Contents, Preface, several Chapter Excerpts, and the Index. We're proud to publish the latest edition (2017) of Dr Sharon S. Ehrmeyer's popular guide to rules, regulations and requirements. 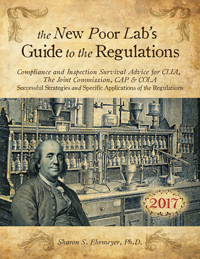 For laboratories seeking compliance with CLIA, CAP, TJC, and/or COLA, this is an essential source of practical advice and down-to-earth tips. A new book about Risk Analysis for Medical Laboratories. Combine the general approach with quantitative Six Sigma techniques for more reliable solutions. Includes a review of ISO standards, applicable CLSI guidelines, and JC Proactive Risk Reduction Methodology. NOTE: The 3rd Edition is now available.